Do You Know How to Match Your Content to Buying Cycles? 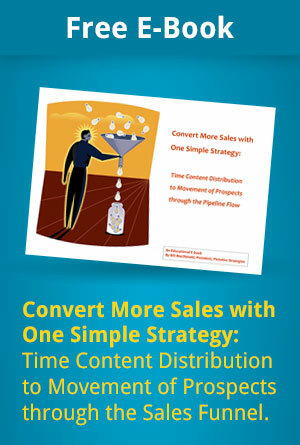 Download “Convert More Sales with One Simple Strategy: Time Content Distribution to Movement of Prospects through the Sales Funnel.” This short e-book will help you match up content to where your prospect is mentally in the buying cycle. Address his true needs as he begins to formulate them. And, as a result, you’ll streamline your lead pipeline or sales funnel with educational information to advance the sales process and your sales performance. What type of content inspires the prospect to move through the pipeline? Get your free e-book now, fill out the form below.